Stingy defense was the name of the game this weekend in Northern Kentucky as five teams posted shutouts. Covington Catholic continues to dominate. Simon Kenton and Beechmont keep on racking up wins. After that, the question marks begin to arise about who else is good south of the river. For the third straight season Campbell County (2-1) takes down NewCath (1-2). It was the first shutout by the Camels since their regular season finale in 2013 against Holy Cross, a span of 51 games. Campbell County was led by quarterback Andrew Helton who threw for 168 yards with a pair of touchdown tosses to Reid Jolly. The scores for Jolly, raises his team high total to five for the year. The Camels will entertain Cooper (0-1) next Friday. NewCath looks to rebound on the road at Belfry (1-1). There are only four teams in Class 6A that are 3-0 after this weekend and Simon Kenton is one of them. The Pioneers defense hounded Conner (1-1) by forcing four turnovers and getting on 10 tackles for losses including a pair of sacks. JJ Courtney and Clay Cogswell were menaces for Simon Kenton. Cogswell had nine solo tackles, three tackles for losses, with two forced fumbles and an interception. Courtney returned one of those forced fumbles 35 yards for a score to go along with his three tackles for losses. Pioneers quarterback Caleb Farfsing ran for a game-high 120 yards and a touchdown. He has 316 yards on the ground over the last two contests. Simon Kenton is on the road at Dixie Heights (0-3) next Friday evening. Conner is home to face Scott (2-1). The winning streak for Covington Catholic (3-0) has now reached 18 games after crushing Cooper (1-2) in all phases of the game. All of those Colonels victories have been by 21 points or more. Senior running back Casey McGinness carried the ball nine times for 176 yards and three first half touchdowns. He also had two receptions for 47 yards. The CovCath defense stymied the Jaguars ground games holding them to -7 yards on 16 attempts. Cooper is off to Campbell County (2-1) on Friday. Covington Catholic will host Kings (2-1). The Knights were the team that lost to the Colonels by the fewest points (21, last September) during their current streak. Bellevue (2-1) won its second straight in a thriller over Bishop Brossart (2-1). Tigers running back Will Ryan ran for 211 yards on 27 carries and found the end zone three times (two rush, one rec). It was the second straight week that Ryan has topped the 200-yard mark on the ground. He ups his season total to 536 yards on 54 totes with eight touchdowns rushing. Bishop Brossart has a Thursday evening affair at Newport (2-0). 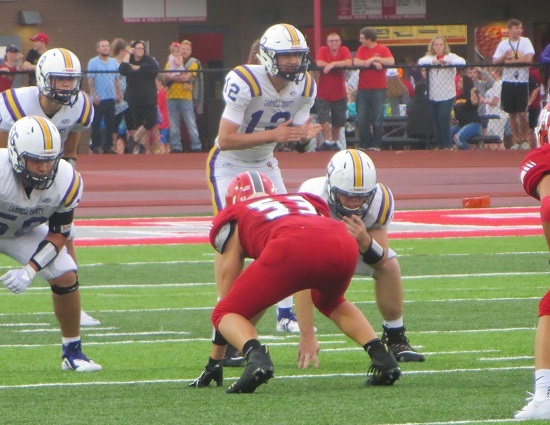 Bellevue heads north of the river to take on St. Bernard-Elmwood Place (1-1) on Friday.